Originally from Italy but now a proud Londoner, Pagano divides himself between his many jobs as a Music Producer, Record label boss, Remixer, but most of all, a successful DJ at some of Europe’s most iconic events and clubs. 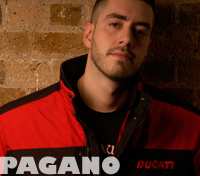 His flawless mixing skills, and instinctual ability to know exactly what is emerging on the musical radar, has established Pagano as one of the driving forces behind the London & European club scene. His passion for electronic music is as close to an obsession as it can get, his ability to connect with the crowd is unmatched because Pagano’s main aim is to share the music he likes with like-minded people. Pagano’s DJ sets are always packed with his exclusive bootlegs, original productions and remixes. As a producer Pagano has successfully completed a number of releases on many prestigious labels such as Stereo Productions, Iberican, Champion, KULT Records US, Universal FR, U.M.M, Hoxton Whores - Disco Darlings, BXR, Media Records, with his own name or under various alter egos. Through the years Pagano’s original productions and remixes have been supported, during their DJ sets and Radio Shows, by a variety of DJs including big names such as: Paul Van Dyk, Bob Sinclar, Marco V, Chus & Ceballos, Tiesto, Fergie, Cevin Fisher, Danny Rampling, Quentin Harris, DJ Vibe, Abel, and others. Pagano’s very own project ‘Marvellous’, released on Chus & Ceballos label Stereo, has been included in the compilation ‘After Dark vol. 2’ on Roger Sanchez’s label Stealth and has been charted by American icon Junior Vasquez in his top ten! Moreover during the last 2 years Pagano has achieved 3 Top Ten hits in the official ‘UK CLUB Chart’ and in the ‘DMC Club Chart’ and 1 Top 20 in the ‘UK Cool Cuts’. Pagano has remixed or collaborated with a myriad of artists and DJs including: De’lacy, Robin S, Kathy Brown, Stewart Who? , Peyton, Billie Ray Martin, Chus & Ceballos, Giangi Cappai, Alan Thompson, Mario Piu’, Joy Kitikonti, Mauro Picotto, Per QX, Wayne G and the list goes on. A former resident DJ on Saturdays at Heaven and Sundays at Fabric, Pagano is currently one of the resident of the renowned Amsterdam event ‘RAPIDO’, where his 7 hours DJ sets at the official After Party are now notorious. In the UK Pagano has played regularly for events at Ministry of Sound, Turnmills, EGG, Area, Fire, Crash, The Fridge, Scala, to name a few, and for high profile brands such as Trade, Matinée, SuperMartXé, Abstract, DTPM, Breakfast, Party Proactive, Extreme Euphoria, Godskitchen Global Gathering and many others. 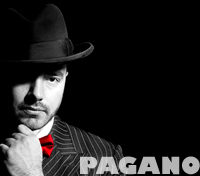 Internationally Pagano has toured extensively playing at a variety of clubs and events around the world including: Alegria (New York), Space (Miami), Industry (San Francisco), The Body Shop (Atlanta), ARQ (Sydney), Fresh (Amsterdam), Space (Ibiza), Privilege (Ibiza), WE Party (Madrid), Row14 (Barcelona), Heaven Ibiza, Circuit Festival (Barcelona), La Demence (Brussels), Muccassassina @ Qube (Rome), The Block (Padova), Planet Ios (Greece), Club Latex (Cairo). In 2007 Pagano was the only Italian artist to be invited to perform at Miami’s ‘Winter Party' Festival.